News about a new eat all-you-can restaurant came about just this Thursday, as friends have been raving about it, I guess it's time we give it a try. Vikings, the newest addition to the buffet-all-you-can market in the Philippines is now open, and it sure looks promising. We have made our reservation since last Thursday, since our family is a big group. News travel fast and indeed this fairly new buffet place definitely is making waves. Now what is in store for you in Vikings? 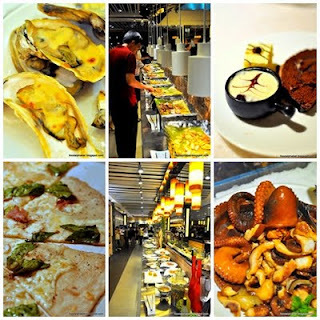 Vikings A feast from the sea is an international themed buffet restaurant which caters to a wide range of special delicacies made known to the world. 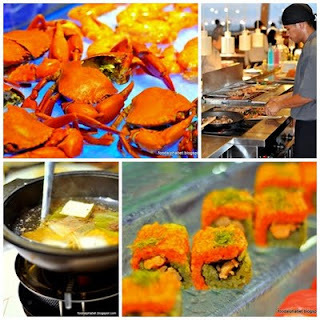 They have a wide selection of mostly Asian dishes which include Japanese foods, such as tempura, fresh from the sea sashimi and tons of sushi!! Chinese foods include dimsums, roastings, and lots of familiar Chinese dishes. American delights that showcases Roast beef carvings, lamp chops, mini-burgers and fries, onion rings and more. They have a pasta station, a salad bar, a fresh seafoods station, a pizza station where you can make your own pizza, a grilling station, a shabu-shabu station...yes this is new!! 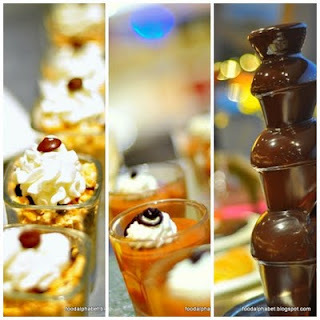 A bountiful desserts line-up with cakes, pastries, fruits, chocolate fondue, ice cream, halo-halo treats and what!! a Frozen Yoghurt station!! Now can I stop? Not Yet! They also have drinks-all-you-can counter with sodas, fruit juices, coffee, you can also approach their mini bar to get a fresh shake just for you, well that evening they served yoghurt shake called Piña Colada which was a mix of pineapple, mango and yoghurt Yummy indeed and this one I'm sure will be the driving force to get your butts moving... ALL YOU CAN DRINK DRAFT BEER!!!! I believe just by seeing this you would be scrolling down to look for their contact nos. and make the next reservation available. All that for a price of only P888!!! WOW, that is fairly cheap! But wait, they are still on introductory promo until April 20! You get an automatic 20% discount, plus if you like them on Facebook you get an additional 10% off! Kids up to 4 ft. is P388 for dinner and Kids below 3 ft. dine for FREE!! Special discounts for senior citizens aged 75 and up get 50% off! Presently, they only open for dinner, but they should be kicking off their lunch schedule soon. Word of advise, be sure to reserve your seats before going to the place or you will wait for quite some time before getting a table. Since they only opened for just a few days, I gave them extra credit for their impeccable service, but as new restaurants arise, there will be problems, so you need tips? Lines do occur so first to get in line? The tempura station, they cook it fresh, so you better order ahead and take note of your table no. at all times so that they could deliver it to you.... not just with tempura station but almost all stations so that is impeccable service. Next to get the line is the roast beef and lamb chop station as you would want to have them pan grilled to your level of satisfaction. Well, for the others you can just stroll around get whatever you like. Get me that beer refill. 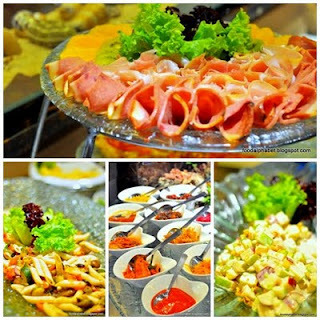 Enjoy and have a wonderful time at Vikings Luxury Buffet. You may reach them at 846-3888, 846-4888, 846-5888 or 0917-5653888 and 0923-7303888 for reservations. Help them to reach 4,000 likes for them to extend their promo price until May 1. Go and like Vikings luxury buffet on Facebook now! This looks like a great place to visit. I'd probably check it out when I get the time. Those foods are all looks so delicious and I am craving for them. That restaurant is really interesting. Hope one of this day I can visit there and have a wonderful dine-in. I am looking forward to that. Thanks. Italian fine dining at Buon Giorno!